His story probably isn’t that different to yours. Do Ho Suh was born in South Korea, left to study in America, settled in New York, moved to Berlin for a bit then chose London as his home. Maybe your journey hasn’t taken you as far, but Macclesfield to Balham is still an uprooting. The point is, we’ve all moved, we’ve all had to leave ‘home’ to make new lives for ourselves at some point. 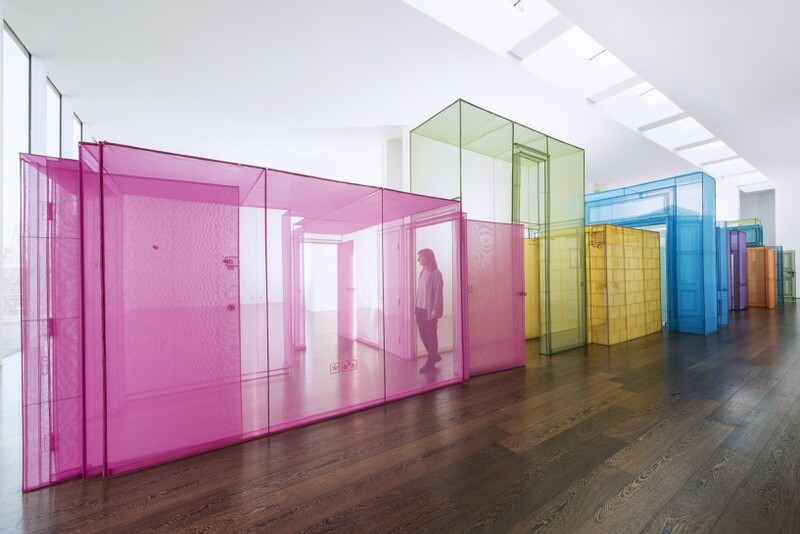 Those moments of upheaval are Do Ho Suh’s total obsession and he uses his art to memorialise the places he’s lived in. In the opening room of his show at Victoria Miro, he has stitched coloured mesh fabric together, recreating the doors and staircases of his past studios and homes. They are like pressed flowers, steamrollered on to paper. They’re 3D sculptures that have been flattened on to 2D planes, as if these doors and staircases have been crushed flat by some temporal anomaly, a catastrophic accident in space, a dimensional apocalypse.